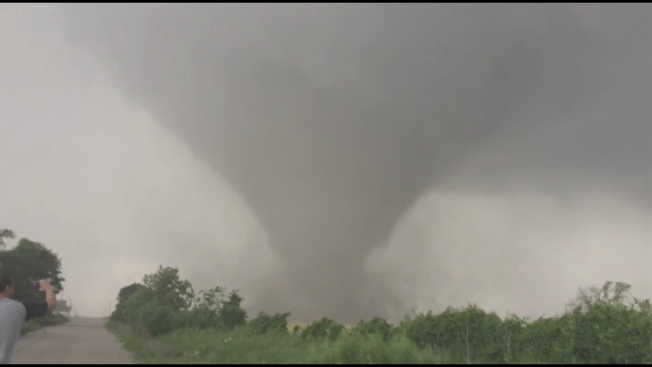 Multiple tornadoes tore through North Texas on Saturday, leaving one person dead and others unaccounted for in a sparsely populated farming and ranching area as the system slowly weakened while advancing toward Fort Worth, officials said. One of the twisters caused "five miles of destruction" as it ravaged homes in a rural area south of the town of Cisco, about 100 miles west of Fort Worth, Eastland County Judge Rex Fields said. "The homes that I've seen, there are just maybe one or two walls standing," Fields, who also serves as the county's emergency services coordinator, told The Associated Press. "(The tornado has) taken them into pieces and blown them out into pastures." Fields said one person was killed and there were likely other injuries. Authorities were going house to house to assess the damage, but that proved difficult amid the heavy rainfall, he said. The extent of injuries or fatalities also wasn't immediately clear in the town of Burkburnett, about 15 miles north of Wichita Falls, where a second tornado touched down. A police dispatcher who declined to give her name due to department policy said tornado sirens could be heard in Burkburnett just before 6 p.m.
As the storm moved toward Fort Worth later in the evening, the National Weather Service had canceled tornado warnings in the counties still in its path. The weather service on Saturday afternoon had elevated to "moderate" the risk of tornadoes in the Dallas-Fort Worth metropolitan area and elsewhere across North Texas. Eastland County, which was part of the enhanced zone, was pelted with 3-inch hail as the storm rumbled through. Storms also brought heavy rain and quarter-sized hail to parts of southwest Oklahoma on Saturday afternoon, but meteorologists said there was so much rain -- and so little sunshine -- that the tornado threat there lessened throughout the day. Parts of western Kansas also were hit by severe weather ripe for tornadoes. In Kansas City, in the eastern part of the state, a band of rain halted the Sprint Cup race at Kansas Speedway.